On April 1, 2014 the CASE Career Center opened for business! CASE now has an interactive job board, the CASE Career Center. With its focus special education administrators and professionals, the CASE Career Center offers members, and school districts, a highly targeted resource for online recruitment. Just like those April showers bring results in May, getting on the CASE Career Center now will hopefully get you results in May! Both members and non-members can use the CASE Career Center to reach qualified candidates. Employers can post jobs online, search for qualified candidates based on specific job criteria, and create an online resume agent to email qualified candidates daily. They also benefit from online reporting providing job activity statistics to track each job posting's return on investment (ROI). For job seekers, CASE Career Center is a free service providing access to employers and jobs in education. In addition to posting their resumes, job seekers can browse or view jobs based on the criteria they find matches their goals best. Job seekers can also post confidentially with confidence or search anonymously by creating a Job Agent. Job Agents notify job seekers via email when jobs matching their criteria are posted eliminating the need to visit their online accounts daily to track new postings. Clicking here to go to the main site to either learn of new jobs, post your resume, or post your positions. There is a modest fee for posting positions on the site but we believe you will have a greater reach with this dedicated career center on our website — click here to become a job poster. It's Not Too Early to be making plans to attend the 12th Annual CASE Educational Legislative Leadership Summit (ELLS), July 13-16, 2014! Watch for a very short, early bird registration at pre 2014 prices on the CASE website. This year as every year, is a very important time for CASE to have as many different states represented up on the Hill for our visit on Tuesday, July 15. There are several really important national issues we will be working on in DC this year with our other association partners. Don't miss this great opportunity. And, with a hotel group rate of $149 at the Hilton Old Town, right across from the King Street Metro stop, this might be a great time to do a DC excursion for you and the family! Group rate ends June 17 so click here to make your hotel reservations! Click here to download a flyer. The CEC convention is this week! If you are attending CEC, we hope you can attend the CASE member/board meeting on Wednesday, April 9. We will begin with a great, full breakfast buffet, sponsored by eSped at 7:30-8:30 and then the meeting starting at 8:30 and going until about 4:00. Awards will be sponsored by Stetson & Associates. We always have an awesome break in the afternoon and this year it is sponsored by Scholastic, Inc. During the annual member meeting we will be having an update on policy issues by the CEC Policy and Advocacy unit, hearing about the upcoming membership changes from the CEC Membership unit, hearing the results of the CASE election, and providing input to the CASE leadership on the upcoming projects and possible projects. We are still looking for names of CASE members who have passed away since April 2013, please send their names, state/provincial affiliation, and a short note so we can recognize their service and lives during the Necrology/Memorial during our annual meeting on Wednesday, April 9. Please send the details to me by clicking here. Once again, this year our Showcase session will be on Thursday morning and will be Julie Weather, Esq with her great legal update! The Showcase will be sponsored by Scholastic, Inc. If you have attended this session in the past, you know we always run out of room. I don't think we will that problem this year — CEC has scheduled us in a great lecture hall that seats 600 people so invite everyone to come hear this great speaker. Her handout alone will be worth the effort! There are a few tickets left for CASE Night, co-sponsored by C8Science and Star Autism Support. Just think, heading out to the ballpark with 174 of your colleagues on Thursday, April 10, 2014 for food and a great ballgame! We will have appetizers, dinner, cash bar and lots of fun at a pregame tent party at the Citizens' Bank Park and then we will be sitting together for the Phillies vs. Brewers game! Click here for the flyer and click here to purchase your tickets! 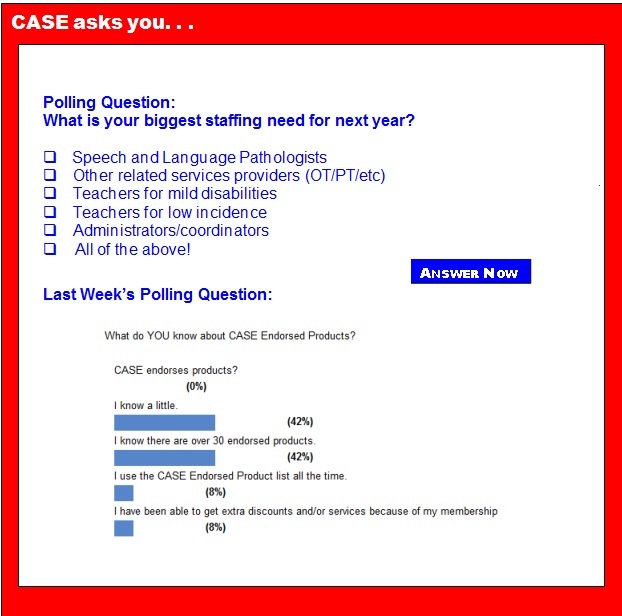 Did you know CASE has been presenting a great session for the last 5 years on What Every Aspiring SPED ADMIN Needs to Know at the CEC Convention? Goal 3 of the CASE strategic plan states, "CASE will be active in the development and mentorship of special education administrators. The CASE leadership realized what better opportunity to "expose" teachers to the joys and "how to" of the special education administration career ladder than at the CEC convention. So, if you have teachers attending CEC who would benefit from this great session, please encourage them to attend and if you are available at that time (Friday, April 11 10:30-11:30 room 204C in the convention center) come join us. It is always a well attended, exciting session filled with encouragement as we see ourselves as we were a "few" years ago! Lots of exciting things going on at CEC — See you in Philadelphia! Hope to See You in Philly at all the CASE events and especially at the CASE Booth — #533! For many schools, one of the biggest challenges to developing a well-functioning RTI program is an effective Tier 2 system. Tiered instruction is the key to any Response-to-Intervention model and without a strong middle tier; it’s challenging to systematically provide early intervention for students at risk. Offering a quality Tier 2 system, takes a combination of the right assessments, tools and strategies, but most important it takes having the right information to make the right decisions for the children in our care. Whitfield County, Georgia has implemented an award winning cognitive training program as a supplemental intervention for identified RTI Tier 2 and special education students. This program focuses on the remediation and assessment of the 8 areas of executive function. The program includes imbedded assessments from the NIH toolbox which allows educators to clearly identify any underlying cognitive strengths and weakness of their students. The computer based program, which adjusts every 10 seconds based on the students response, creates a unique path to strengthening Executive Function skills. There must be something in the water in the office buildings of the U.S. House of Representatives. Recently, there have been two, bi-partisan, education bills introduced — a departure from business as usual! Using evidence-based special education practices is not only what is best for students, but it is required by law. To help special educators do this, the National Center for Special Education Research — one of four centers within the Institute of Education Sciences, the research arm of the U.S. Department of Education — has been investigating critical questions to expand our knowledge and understanding of infants, toddlers and children with disabilities. "English is a great language, but it's part of the problem." Words of wisdom from Margie Gillis, project director at the Haskins Literacy Initiative at Yale University, delivered earlier this month to a room of parents and educators at Royle School in Darien, Conn. The National Center for Learning Disabilities just released an article citing new data from the U.S. Department of Education, which states that "students with learning and attention issues are shut out of gifted and AP programs, held back in grade level and suspended from school at higher rates than other students." A program that places recent college graduates in teaching positions across the country after just weeks of training says it will beef up its focus on special education. Teach for America said it will "strengthen" training that its participants receive on "ability-based mindsets and inclusive practices." The group also said it plans to expand alliances with local organizations in the communities where its teachers work in order to better serve students in special education. Currently, more than 10 percent of Teach for America's 11,100 teachers are working with students in special education in the nation's schools, often through inclusion environments, the organization said. With the reauthorization of the Individuals With Disabilities Education Improvement Act in 2004 (IDEIA 2004), Congress introduced the Response to Intervention and Instruction framework as a way to address the diversity of students and learning issues in U.S. schools. Through early identification and intervention with students who have language and cultural differences and learning delays, the framework promises to address problems early on, thereby decreasing the number of students incorrectly assigned to receive special education services. The Obama administration credited its signature K-12 education program, Race to the Top, for unleashing "enormous positive change" in public school classrooms across the country. In a conference call with reporters to mark the fourth anniversary of the creation of Race to the Top, the White House's Domestic Policy Council director, Cecilia Muñoz, and Education Secretary Arne Duncan rattled off examples of what they said was proof that the $4 billion competitive grant was driving "dramatic change." How do we know that Race to the Top worked? The Obama administration is announcing major progress as its signature education policy, the Race to the Top competition, winds down and the money runs out. Many states that won a federal grant in the $4 billion program that is now entering its fourth year have followed through on promises to adopt the Common Core State Standards and launch new teacher evaluations along with an assortment of other policies, including opening new charter schools, training teachers, and offering more Advanced Placement classes. Others are still working on it. In the four years since the Obama administration announced its first Race to the Top grants, the president's signature education initiative has helped spark a wave of reform across the country, according to a new report by the White House and Department of Education. Since the Obama administration announced the first Race to the Top grants to Tennessee and Delaware four years ago — many state and local leaders, educators, and communities are deep in the hard work of education improvement, and the nation is seeing progress. Dyslexia is a language-based learning disability which makes it hard for those who have it to learn to read and write. According the Pennsylvania branch of the International Dyslexia Association, it's the most common learning disability. "15 to 20 percent of the population have some level of dyslexia." said Pittsburgh region of the Association Chairperson Christine Seppi. "That's a really huge number. Autism, which gets a lot of press, has one in 50. This is one in five or six." A one-day conference in Pittsburgh will shed light on the disorder and help parents, teachers and others better understand dyslexia. On a recent weekday morning, a six-year-old girl with brown pigtails stared at an iPad perched on the desk in front of her. As she studied the screen, she squinted her eyes, and her brow furrowed into a pair of delicate question marks. A minute ticked by. She was still perplexed. Then suddenly, the iPad emitted a soft, triumphant-sounding ping, and her face lit up. The girl had successfully solved a mathematical puzzle in the educational software program ST Math. At adjacent desks, her first-grade classmates at Jack L. Weaver Elementary School, in Los Alamitos, Calif., were grappling with their own ST Math challenges. The room was silent, with no hint that the morning recess was just 15 minutes away. "They could do this all day," the teacher, Kathi Ruziecki, whispered. "English is a great language, but it's part of the problem." Words of wisdom from Margie Gillis, project director at the Haskins Literacy Initiative at Yale University, delivered earlier this month to a room of parents and educators at Royle School in Darien, Conn. Gillis's visit was sponsored by Darien's Special Education Parent Advisory Committee, and she spoke for roughly two hours about dyslexia being both a blessing and a curse. As with any learning disability, teachers make the biggest difference with students and their ability to learn, Gillis said. "They are the most important variable," she said. Time is a tricky concept — even for us adults. Some days seem to drag on for a year and others fly by in a minute. But understanding time helps kids to use their time well. It's a key part of executive functioning skills such as planning and prioritizing. A sense of time develops over time. Two and three year olds enjoy the predictability of routines but live mostly in the present, their sense of time involves mainly "now or not now," and they have limited ability to wait. Five and six year olds have a clearer understanding of past, present, and future. They can anticipate happy events and have some grasp of "next week" versus "tomorrow" versus "a long time ago." Seven to ten year olds have the arithmetic skills necessary to use clocks and calendars.